Video released Thursday shows a 2013 fatal shooting of a 17-year-old carjacking suspect by a Chicago police officer, though footage of the moment the teenager is shot doesn't clearly answer whether the teen turned toward the pursuing officers or was holding anything, as the officer who opened fire has said, reports the Associated Press. A federal judge lifted a protective order on the video of Cedrick Chatman's last seconds after the city — in a surprise about-face — dropped its longstanding opposition to making it public. Since the November release of video in a separate case showing a white officer shooting a black teenager 16 times in 2014, city leaders and the police department have come under intense scrutiny over cases of alleged misconduct amid calls for greater transparency. 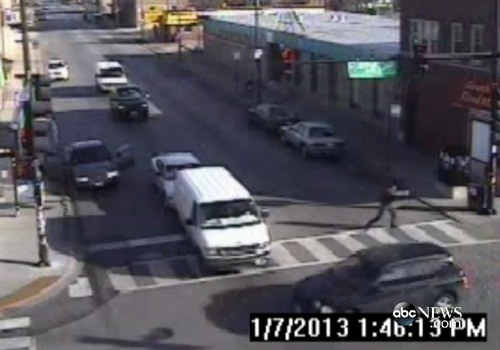 The video released Thursday was shot by several surveillance cameras and from various angles. It captured at least parts of the Jan. 7, 2013, incident in a South Shore neighborhood during daylight hours.